PHOENIX — The McArthur Ballroom of the Arizona Biltmore was as packed as one might imagine for a session in which all 32 NFL head coaches were being made available to media in one space. Crowds around the assorted round tables occupied by the coaches fluctuated as reporters mingled for the span of an hour Tuesday morning. Yet the mob around one table, located near the back of the ballroom, was notably large compared to the others for the duration of the session. It wasn’t for Bill Belichick. Any reporter who wanted to speak with the Super Bowl-champion Patriots coach, located adjacently, needed to fight through the horde of media standing or sitting around Freddie Kitchens and waiting to ask the first-year Browns coach a question. Good thing, because this is Kitchens’ new normal. 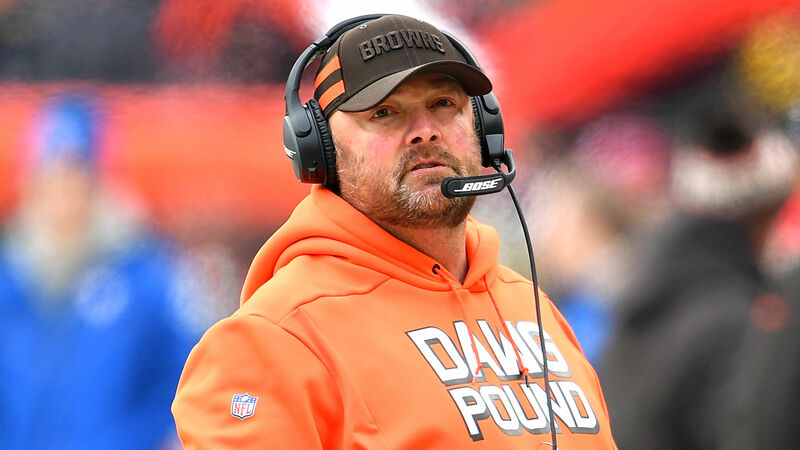 The 44-year-old Alabama native — yes, his accent makes his country-boy background obvious — was hired as Cleveland’s coach in January, the product of an ascent that took him from running backs coach to offensive coordinator to head coach in less than one year. First-year coaches are prone to more questioning than most due to the familiarization process with media. For Kitchens, that’s just the tip of the iceberg. Those roster moves, combined with the additions of defensive end Olivier Vernon and defensive tackle Sheldon Richardson, have flipped the perception of a team that went 0-16 just two seasons ago. As of Tuesday, according to most sportsbooks, the Browns had the third best odds among AFC teams to win this season’s Super Bowl, behind the Patriots and the Chiefs. “Freddie is Freddie. He knows what he’s doing,” Buccaneers coach Bruce Arians told Sporting News. Arians was the head coach in Arizona from 2013-17. Kitchens was his quarterbacks coach from 2013-16, then his running backs coach in ’17. The two still chat, though not as often now that both are head coaches in the NFL. Of all the coaches who occupied the ballroom in Phoenix, the location of the NFL’s annual meeting, Kitchens might have been considered the most approachable. (We mean that figuratively, of course, since he literally was the least approachable due to the swarm around him.) He is loose. He is personable. He likes to joke. He does not appear to take himself too seriously. His look — the signature white cap with an old-school Browns logo, paired with a sport jacket (no tie) and jeans — sums him up perfectly. “You have to have those (high) expectations within your team before you are ever going to get anywhere,” Kitchens said after sarcastically suggesting he is terrified by a high bar. “So that doesn’t change the pressure on me. One would never guess it based on Kitchens’ demeanor, but the task in front of him is not easy. It is actually extremely difficult. Yes, the Browns are suddenly loaded with talented personnel. Sure, the outlook in the AFC North suggests they should be the favorites to win the division, something the franchise has never done in its second Cleveland stint that began in 1999. They have a budding star at the game’s most important position on an affordable rookie contract. Reich, of course, is coming off his rookie coaching season, a year in which he led the Colts to the divisional round of the AFC playoffs. Reich and Kitchens crossed paths back in 2012, when the former was the Cardinals’ receivers coach and the latter was their tight ends coach. We presented the same question to the Chargers’ Anthony Lynn, who also is coming off his rookie coaching season. His answer was similar. On the subject of those who are surrounding Kitchens, it’s worth noting that he is not alone in having to make adjustments. He brought in ex-Arizona head coach Steve Wilks to coordinate the Browns’ defense, and he hired former Tampa Bay offensive coordinator Todd Monken for the same role in Cleveland. Of the 26 men on his coaching staff, 16 are new to the Browns in 2019. Perhaps the best moment of Kitchens’ media session Tuesday was his answer to a question regarding Beckham. The two have not yet met in person, so Kitchens was asked about what he plans to say to the receiver when they stand together for the first time as Browns. His answer went viral.